Welcome to a new Squigglefly Challenge and this week, Holley's Hobbyists are your hosts for April Showers Bring May Flowers! You have two choices, show your showers or water theme or go with May flowers and use a flower image, embellishment, or in the sentiment! For my card I went with the water theme and used the adorable Polly Swims in the Tub by Cheryl Alger, one of Squigglefly's fabulous artists! So come along and join the fun but remember to be eligible to win, you must use a Squigglefly image, if you don't have one, no fear, there are tons of freebies here! Gorgeous card Tammy, I like the adorable image, the colours and the bunting. Adorable! Love your coloring and those little fish are perfect for your water theme. OMG Tammy this is SO ADORABLE!! LOVE your banner and choice of design paper! Fabulous coloring too ... like I said, SO ADORABLE! Have a fabulous day! Super cute, Tammy, and it does make you smile. Such pretty colours and love the water wings for bathtub time! AWW!! Now how stinkin' CUTE is this!!! Really makes me smile for sure! :) Love the colors and darling banner! I believe I will!! How adorable is that!! Cute, cute card, Tammy! Precious! Really like that banner you created on here Tammy....and of course the little fishes are adorable. CUTE and sweet card! omgoodness Tammy - this is just the cutest . . . from the colours, to the colouring, the dp and especially those little fishes! The circle die cut is perfect! Love it! Oh this is so cute Tammy!! Your card made me smile - it is absolutely adorable and your coloring is awesome. I think all kids love playing in the bathtub! Tammy this is darling. I really love your vellum flags spelling out smile. The fish brads put the cuteness over the top! Absolutely one of the cutest cards ever - just adore everything about it and the colors are so happy. Super adorable! Love the banner, bright colors, your expert coloring, and the fishes! Cute, cute, cute!!! Hugz! This is so cute! 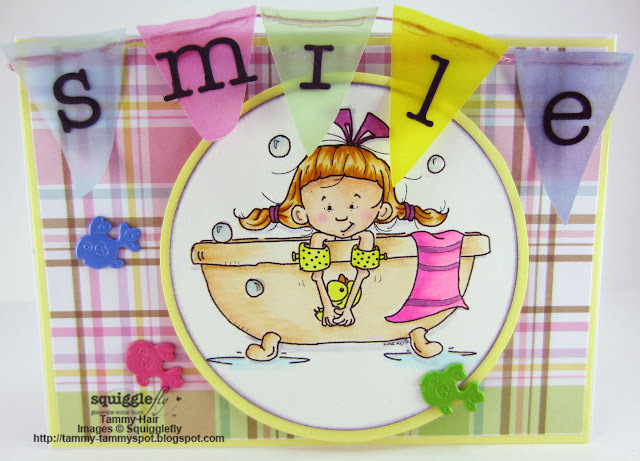 Adorable image and love the bright colors and the banner.